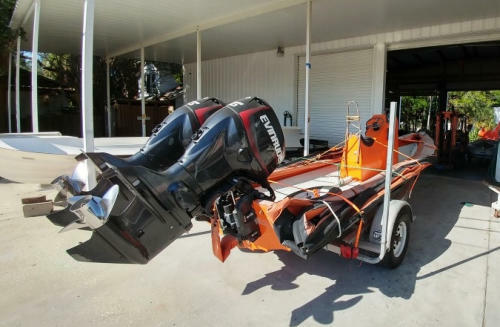 In addition to their great stability and seaworthiness, it takes a lighter duty trailer to transport RIBs and a less powerful vehicle to tow them. 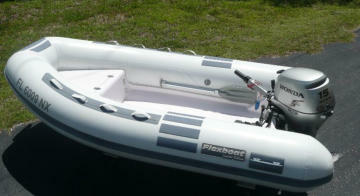 This means the fuel efficiency is better all around, even before you get a RIB into the water! 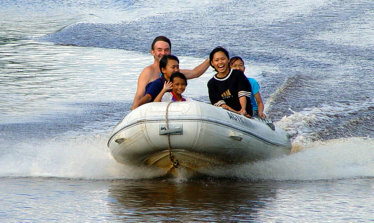 A RIB is a better riding boat than a conventional boat. 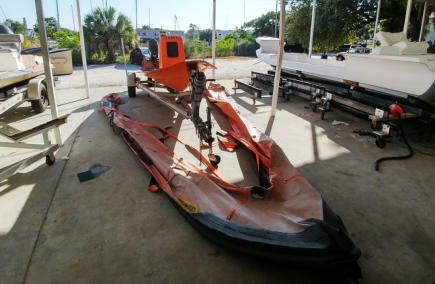 The combination of a deep-V fiberglass hull to cut through the waves, along with a large Hypalon inflatable collar to absorb the wave impact and block the spray makes a RIB a much smoother, drier ride. A RIB is also safer than a conventional non-sinkable boat. A conventional non-sinkable hull typically has all of its flotation built into the bottom of the hull. 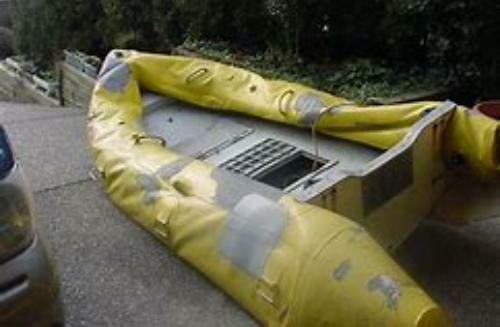 Should an unfortunate circumstance occur (like a swamping), a flotation hull will roll over and throw the occupants into the water. 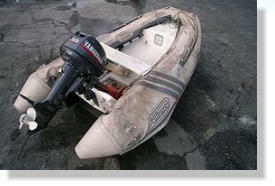 If the same thing should happen to a RIB, the flotation of the RIB surrounds the boat and it will stay afloat upright. 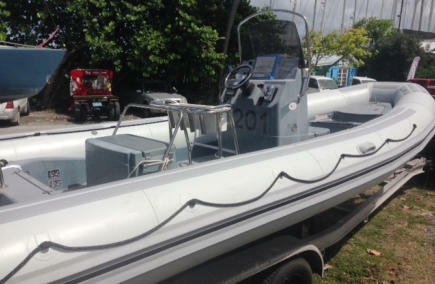 Neither situation is good, but at least the occupants of the RIB will only be wet, and they stay in the boat! And no, RIBs won't sink if you puncture a tube! The best tubes are made with the heaviest Hypalon materials available. They also have multiple air chambers, so that in the event of a puncture the whole boat will not go flat. 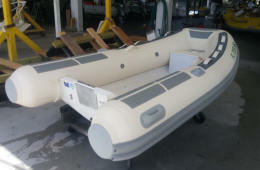 Most will have at least 3 or as many as 5-12 independent air chambers, depending upon the size of the boat. Most everyone knows that the Navy, Coast Guard, law enforcement agencies, and many municipalities use RIBs because they are stronger, safer and built for professional service. 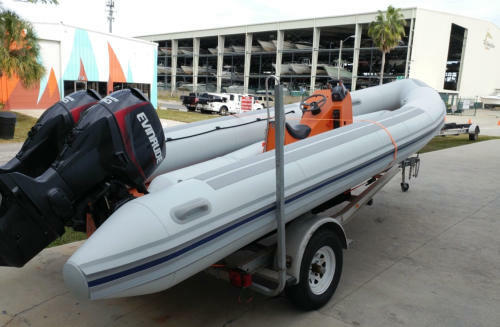 RIBs have great stability and seaworthiness, even at high speeds in big waves! 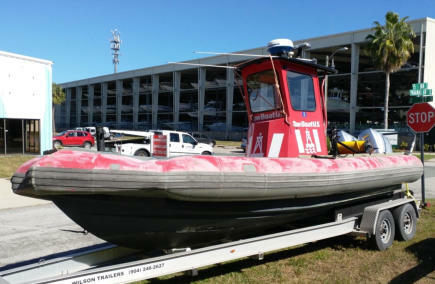 They weigh approximately 25% less than conventional boats of a similar size. 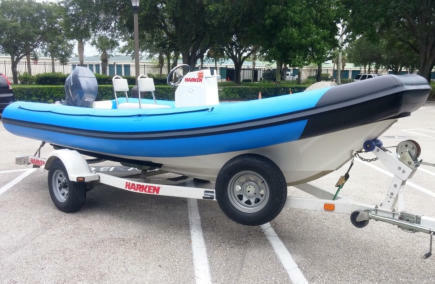 Because RIBs weigh less with their Hypalon tubes, it takes less horsepower to operate them at the same speeds as a conventional boat. 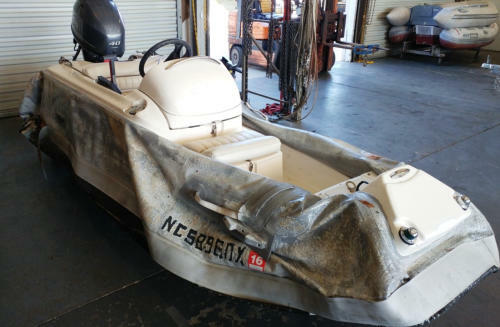 Perhaps one of the most dramatic services we offer involves transforming the lifeless hulk of a worn-out RIB into a vibrant, better-than-new version of its former self. Take a look at some of our retubing examples below, and see if your RIB might be a candidate for this process. It’s hard to believe that a 26 year old RIB in less than perfect condition (photo 1) could look so beautiful after our retubing job (photo 2). Another 26 years of service? Absolutely, if taken care of to protect it from the Florida sun. We’ll happily share with you what you need to do to preserve your RIB. This is a 26 year old Zodiac Hurricane 7.3m that has been “driven hard and put away wet…” in the unforgiving world of marine towing and salvage. 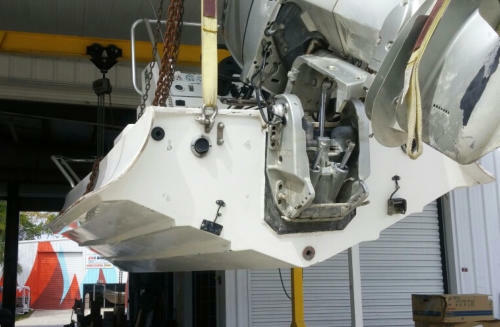 The first two photos show how she looked when we took her in…the next two photos show how she looked when she was going back into service. Novurania builds a beautiful boat, and when the owner of this 21 year old RIB wanted to have it restored he called us. Photo 1) the tubes are about shot, 2) the hull is badly soiled, but otherwise sound, 3) the hull after a lot of TLC to bring it back, and 4) the finished project, restored inside and out. 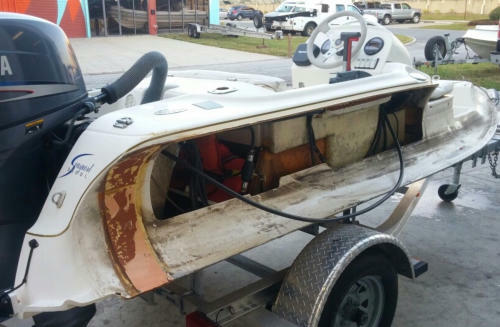 This was a full-blown restoration project involving retubing, reconditioning the hull, and repowering with a new Honda 50 4-stroke. 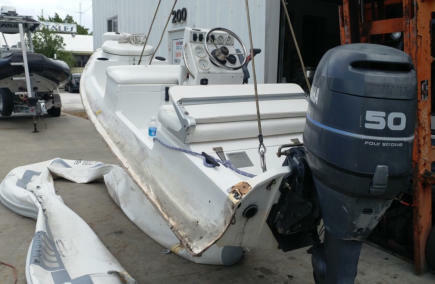 The hull was in poor shape (photo 2), but we were able to bring it back to near perfect (photo 3). The finished project (photo 4) made all the hard work worth while. 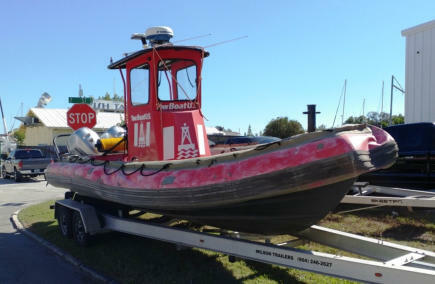 Yes, this 18 year old Avon was in poor shape when she arrived at our shop (photo 1). 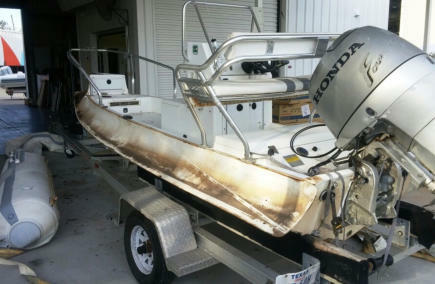 The hull is a bit unusual in appearance (photo 2), but cleaned up nicely, actually very nicely (photo 3). And the finished product (photo 4) again is better than when she was brand new. Loads of features in a RIB that can ride the stern of most any 30-footer, sail or power. 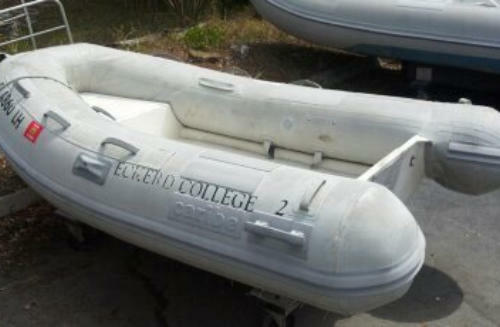 This one was part of the Eckerd College fleet that had seen its better days (photo 1). 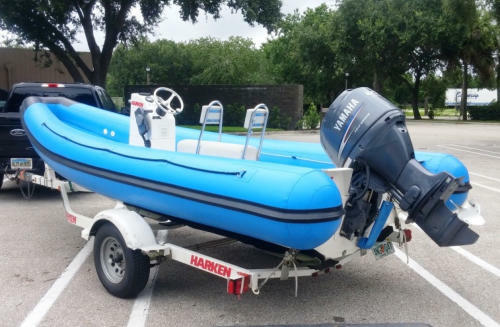 Sporting a new set of sky blue tubes (photo 2), it was ready to rejoin the active fleet on the Frenchman’s Creek waterfront. Retubing…better than new Rob Note: Is the photo on the left really a Caribe T12 - it looks so much shorter than the finished product in the second photo - pls check it out. 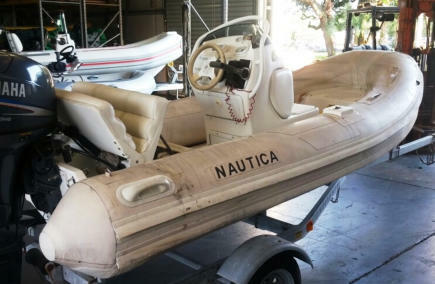 What you cannot see in the first photo of this Nautica Deluxe 12 is the severe degradation of her tubes. 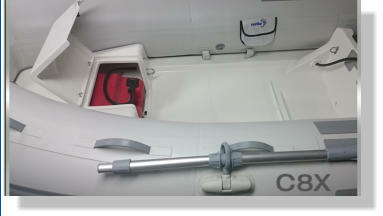 Photo 2 shows the tubeless hull, and photos 3 and 4 show the finished project. 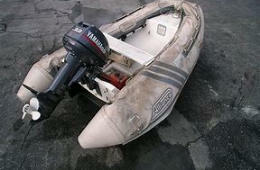 We did retubing only on this RIB. 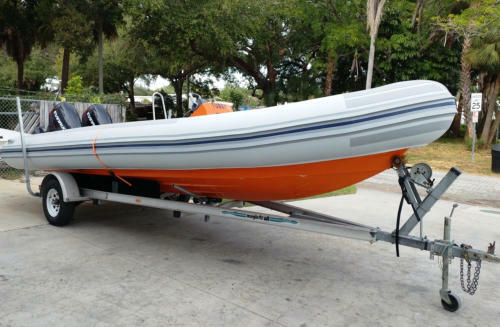 This Caribe Deluxe 20 is a big RIB. Even though she looks in good shape in photo 1, time had taken its toll on the condition of her tubes. 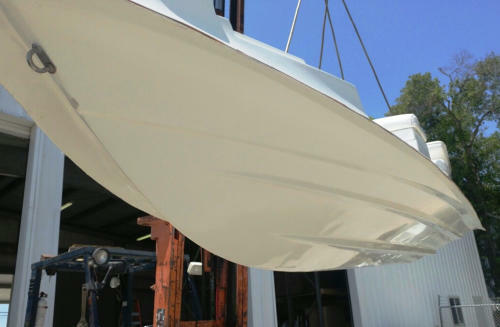 Photo 2 shows the complex fiberglass hull after prepping, and photos 3 and 4 show off the finished project ready to hit the water. These are the tubes for a 2004 Rendova 12. 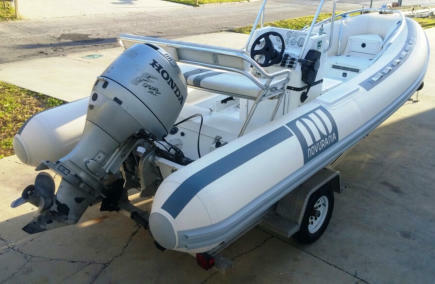 The owner of tis Zodiac 15 decided to change from Zodiac red to white Hypalon. 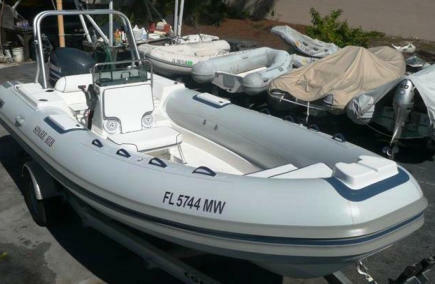 This Dolphin 25 is another good sized RIB. 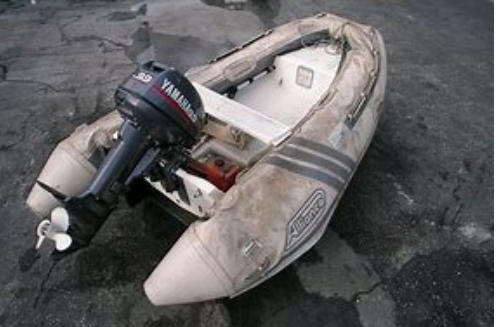 It’s a bit of a challenge, but there is virtually no reasonable limit to the maximum size RIB we can restore. 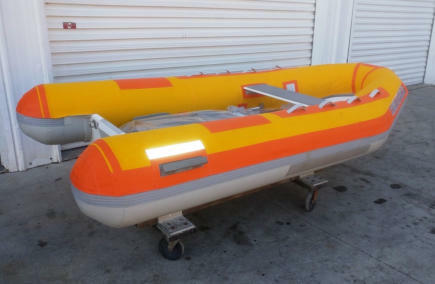 And we don’t cut corners on any size RIB we retube. 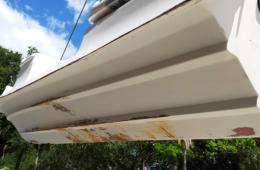 They all get the very best service we can provide - for a “better than new” end result. 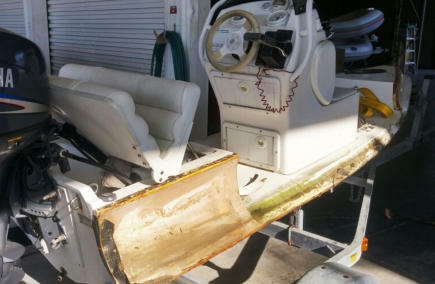 This Humber 24, originally a bright orange, was retubed in white Hypalon Note in photo 3 that the fiberlass hull retained its original color, as did the pedestal shown in photo 4. We suspect that comes up in conversation quite often. 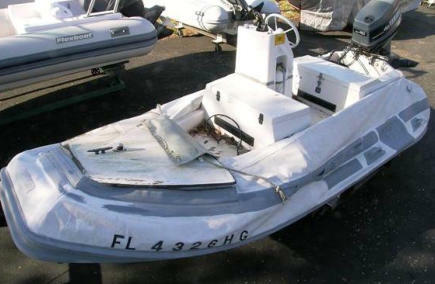 The Ribcraft 5.85m RIB shown in photo 1 doesn’t reveal its true condition. 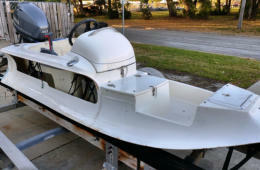 Photo 2 shows its tubeless hull after being prepped for new tubes. 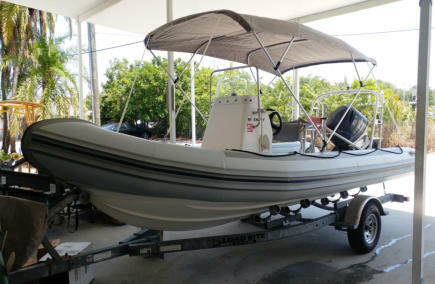 Photos 3 and 4 show the retube project with a new bimini rigged, ready to go. 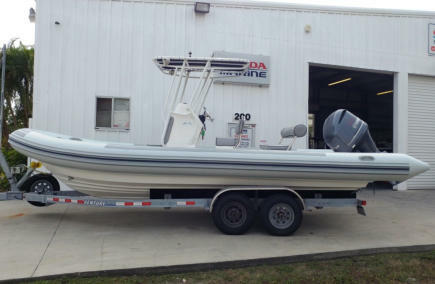 This 2011 VSR 5.8m RIB is from Wisconsin. Vandals slashed the original tubes, and we don’t have any “before” photos. Note the tandem driver/passenger seating and the vivid blue color. 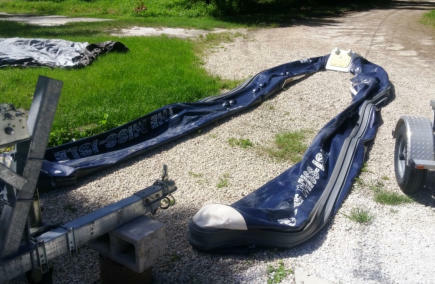 This Chinese 25-footer originally had dark blue PVC tubes. They fell apart within two years in our hot, humid Florida climate. 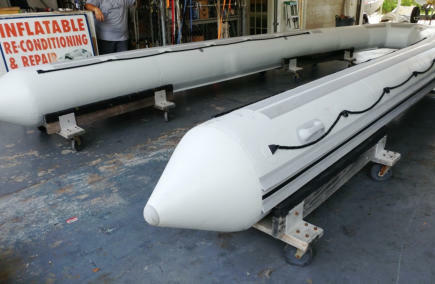 While the tubes were flimsy, the hull was substantial (photos 2 and 3), and a good match for the new white Hypalon tubes shown in the finished product (photo 4). This one is special. 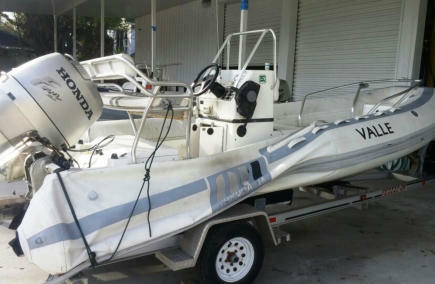 Zodiac sold a 25’ Pro 750 RIB to Marine Max Vacation Club in Tortola. The tubes were PVC. They fell apart within two years. 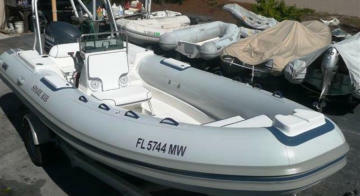 Marine Max contracted us to retube the RIB. 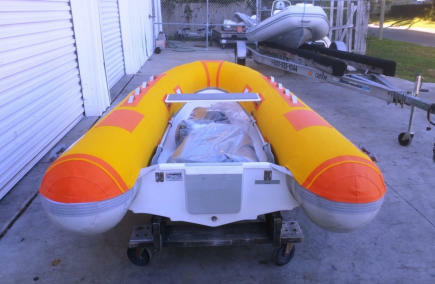 We made the new tubes (photos 1, 2, 3) and shipped them to Tortola. Our installers in Tortola finished the retubing job just before hurricane Irma destroyed everything in that area. Photos 4 and 5 show the finished RIB on land before the storm. 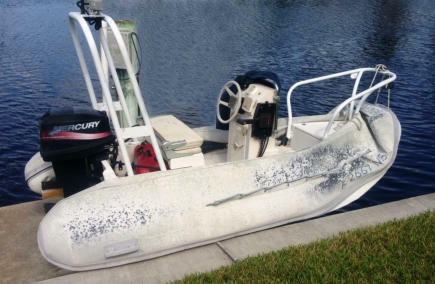 The last photo shows the RIB in the water and full of water after the hurricane. 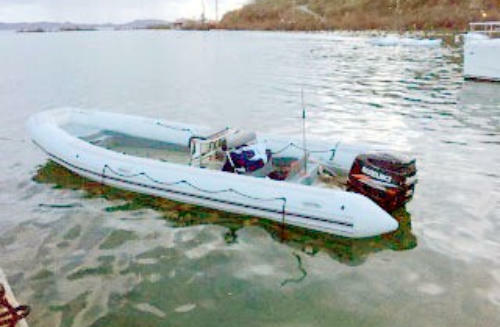 The storm blew away the console, but the RIB remained afloat, albeit full of water, with the tubes and retubing job by AI BOATS intact. 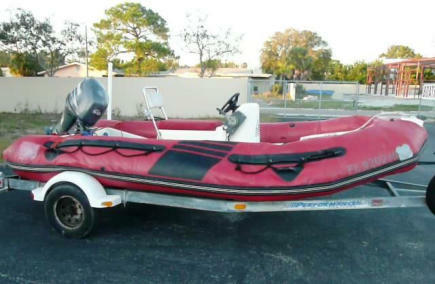 And the way to do that is to have a set of chaps custom made for your RIB. It’s only logical that once you’ve had your RIB restored to “better than new” condition, you need to keep it that way by doing everythiyou can to protect it. Chaps. In this day and age, our time is valuable and we all must do our best to stretch out every dollar we can. 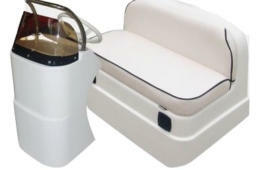 Many people see a RIB in poor condition and think its life is over and it must be replaced. What makes matters worse is that is how most of our competitors prefer you to think. We like to look at things a bit more realistically. 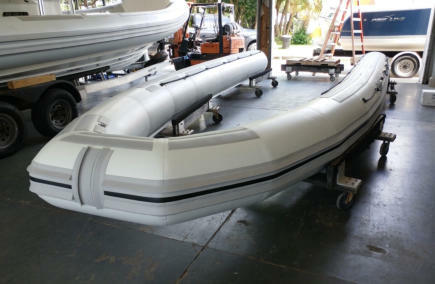 We have developed a process to rejuvenate the Hypalon tubes of your boat. 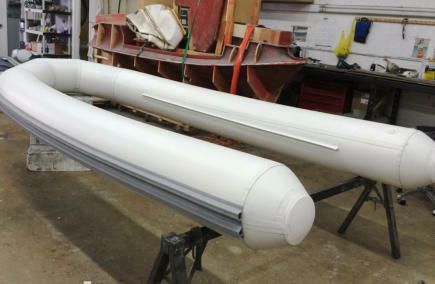 A small repair can make the tubes look like new and get the fiberglass to shine brightly again. Next thing you know, your boat is ready to give you a much longer service life. We believe that a RIB can have a very long life cycle. 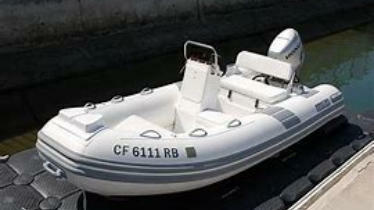 A RIB’s integrity is only as sound as the supporting structure beneath the tubes. A hull failure can render the finest set of hypalon tubes totally useless. Before that happens, bring your hull issues to us so that we can make them right. Peace of mind is important, but the safety of you and your loved ones is even moreso. 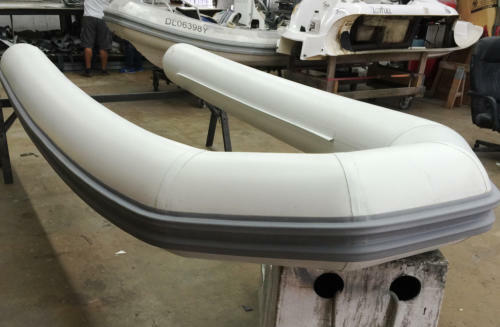 Bottom line is that at AI Boarts we know RIB’s, stem to stern, and we’re going to share with you the best way to fix whatever’s wrong with your boat. How you proceed is up to you. How you should proceed is going to come from us. 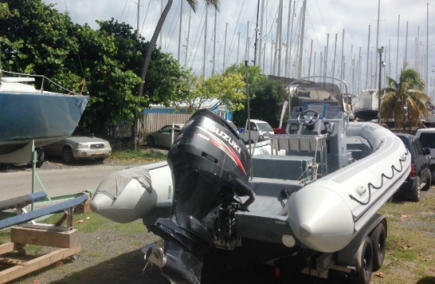 Rigging an engine on a RIB involves a number of factors. 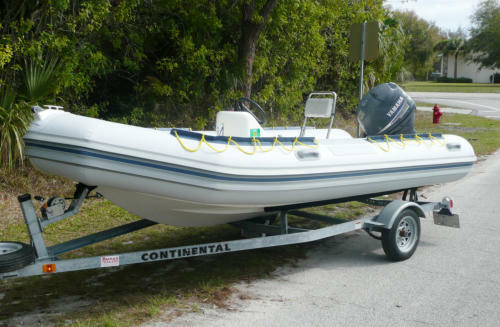 In addition to the obvious - size of the boat, size of the engine - balance, weight, and the intended use also need to be considered. Here at AI BOATS we take a look at the complete picture before coming up with a recommended configuration. The larger the RIB and the larger the engine, the more complex the rigging becomes. Don’t trust the job to amateurs. Let AI BOATS guide you to a safe, first rate installation. Perhaps when you first got your RIB a console just wasn’t in the plan. Now, bolstered by a couple of years’ experience, it seems like a better idea. But consoles aren’t the only equipment upgrades you might consider. 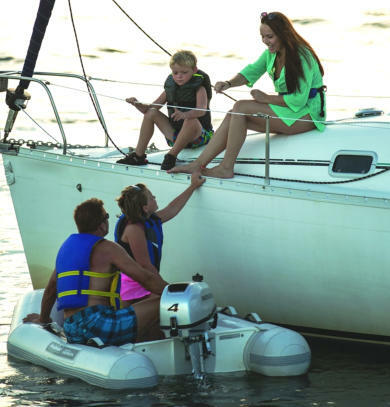 Improved seating, automatic bilge pumps, nav lights - lots of improvements are available to make your boating experience safer and more enjoyable. We can help you choose the options you want (or need) to make that experience come true. 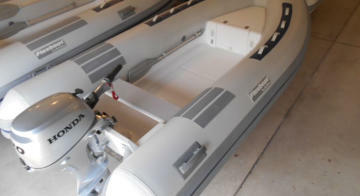 If your RIB doesn’t need to be retubed - perhaps just needs someTLC to bring it back to life again - we can do a thorough reconditioning that will make it look almost like new, inside and out. And if need be, this is the time to make the repairs you’ve been wanting to get done for a long time. 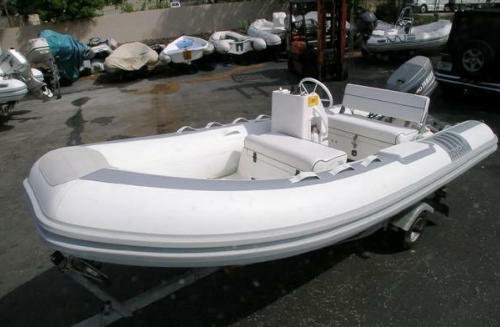 Caribe has been manufacturing inflatable boats since 1983. They have dedicated their efforts to the creation of boats that are both high quality and user friendly. 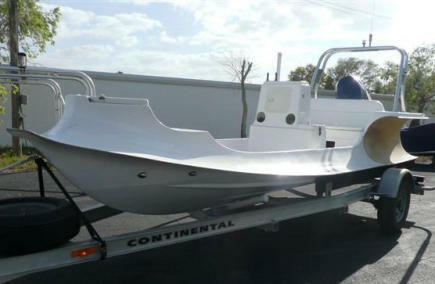 Their focus is the customer, making sure that you have a comfortable, long lasting and reliable boat to enjoy. 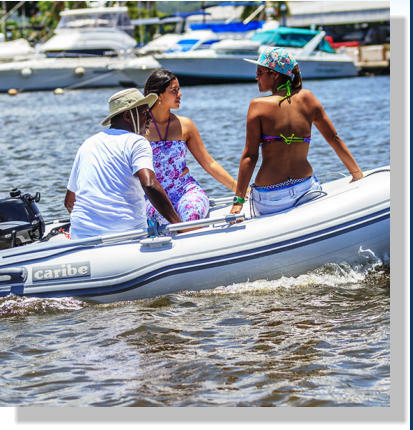 Caribe takes pride in its product, and it shows in so many ways. 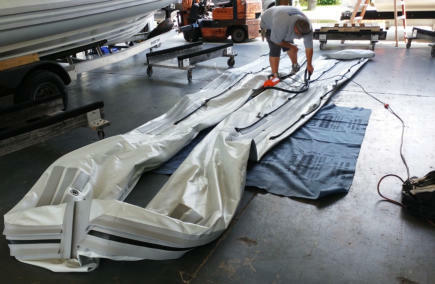 At Caribe, only the highest quality Hypalon neoprene fabrics are used in every model. Every new model is also tested in real world conditions before it is sent into full production. 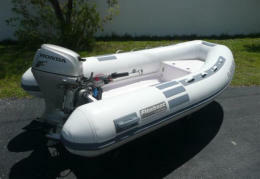 This way you are doubly assured a safe, reliable and comfortable boat. Caribe has over thirty models to meet every client’s needs. From a completely collapsible inflatable, to open deck boats, to work/utility boats, to luxurious console RIBs with numerous additional popular features. 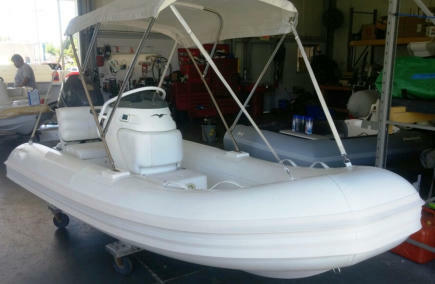 We’re pleased to be able to offer you new boats from one of the most respected names in the inflatable RIB marketplace. 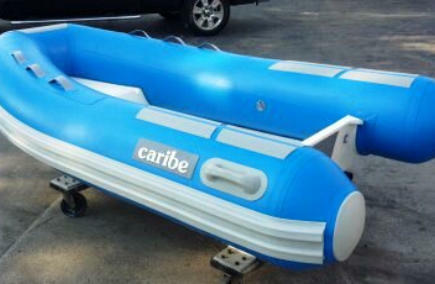 Caribe has been around for over 35 years, and their world-wide reputation as a quality manufacturer is well earned. 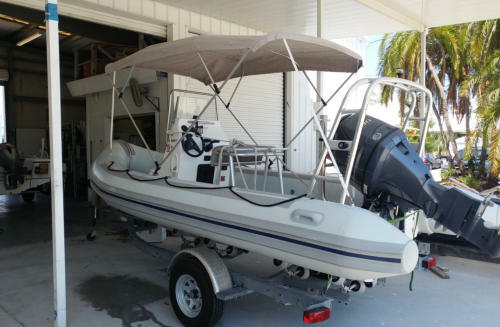 Whether you’re buying or selling, AI BOATS is your one-stop shop to take care of all your needs in this department. With our onsite professional repair, reconditioning, retubing and full mechanical services we can take an inflatable boat or RIB and rejuvenate it to its youthful days to make it a very marketable and desirable product. your day on the water a lot more enjoyable. That’s Honda performance! 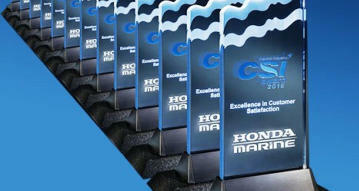 Excellence in Customer Satisfaction for the last 13 years. Packed with dependable power… For mid and smaller horsepower needs there’s plenty of punch in the BF25 and BF30. But it’s power you’ll feel and never hear. That’s because all Hondas are whisper quiet. So extraordinarily quiet Honda doesn’t have to put extra dampening insulation in the cowling like most other manufacturers do. These engines are full of features. Like a Center Mount Tiller with up-front controls. And Autostart Enrichment which makes starting a breeze. And of course, the exceptionally durable BF25 and BF30 are backed by the best standard warranty you can get. The end result? 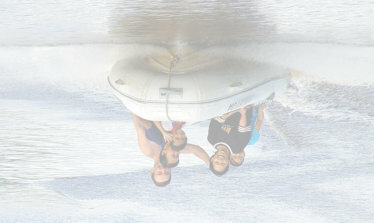 More good times on the water. 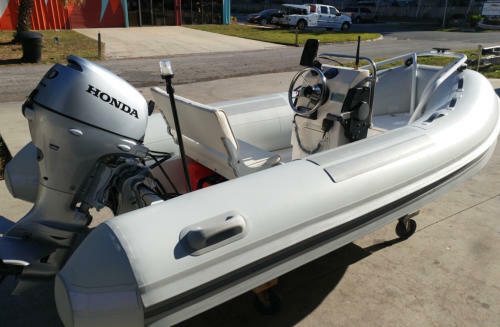 Ready to take you to the head of the class… The BF40 and BF50 are an outstanding combination of Honda’s legendary four-stroke engineering and the latest outboard innovations. The result? 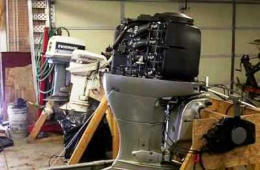 The lightest, most compact engines in their class. With features like BLASTl (Boosted Low Speed Torque) activated by a quick movement of the throttle, and Programmed Electronic Fuel Injection, for easy starts, instant throttle response, slower trolling speeds, and overall better fuel economy. Plus, Lean Burn Control stretches your gas even further by allowng a leaner air-to-fuel mixture. Unmatched maneuverability and convenience… The BF60 is all about being the best. 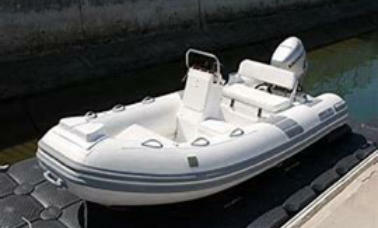 The best maneuverability and highest speed in its class. The best fuel economy. Best in class high output charging. And of course, best time out on the water. Available in two versions, the BF60 and the BFP60 Power Thrust offer powerful performance and exhilarating acceleration. The BFP60 offers a unique gear case and larger propeller that’s ideal for pontoons and larger hulled boats. 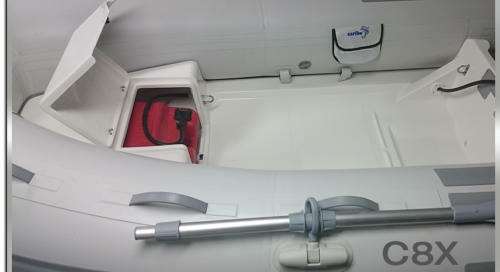 Both versions offer Easy Dock Steering. This exclusive Honda feature takes the anxiety out of maneuvering your boat into the marina. More quality time on the water… You’re looking at Honda’s most advanced technology - a light weight powerhouse in a mid-range package. The BF 75, 90, and 100 offer a host of Honda legendary technological advancements and exclusives. Starting with VTEC technology on the BF90. VTEC provides a superior blend of power, torque, and fuel efficiency at any speed. 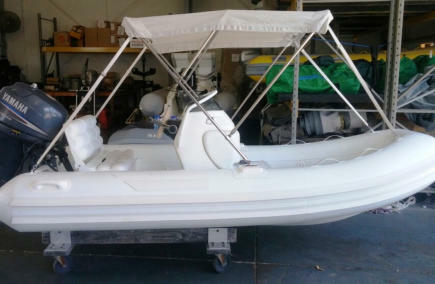 Add in Multi-port Electronic Fuel Injection, BLAST, Lean Burn Control, and a 3-way Cooling System, and you have a pair of motors that are exposive upon acceleration, economical, efficient, and durable - which means maximum quality time on the water for you and minimum fuss. 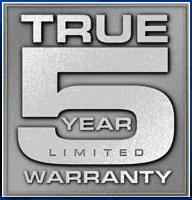 Only Honda gives you a full, five year, non-declining warranty. No strings, No catches, It’s that simple! 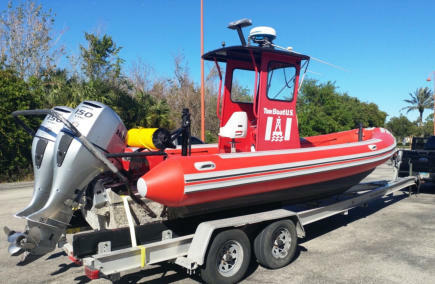 Better Features, Technology, Better Boating… When you are out on the water you want a reliable outboard that will take you places. And of course, Honda’s world famous quality is a no brainer in that department. But the BF115 is much more than that. 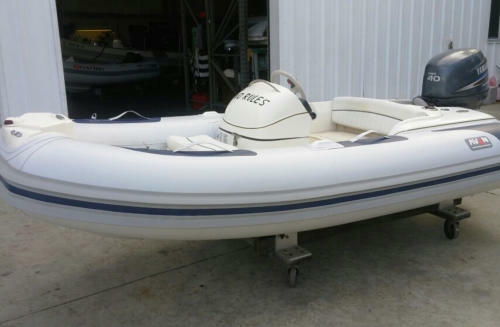 It has better features and better, more advanced technology that make your boating experience that much better. Like best in class displacement, NMEA 2000 certification, Honda’s exclusive BLAST and Lean Burn Control for class- leading performance and maximum fuel efficiency. 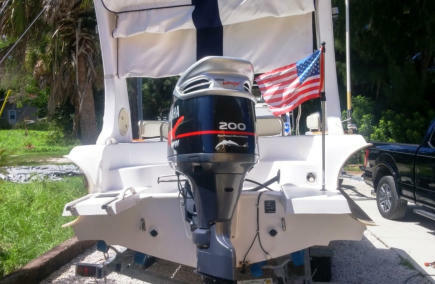 An impressive 40 amps of charging power plus variable speed trolling. And we’re just getting started! 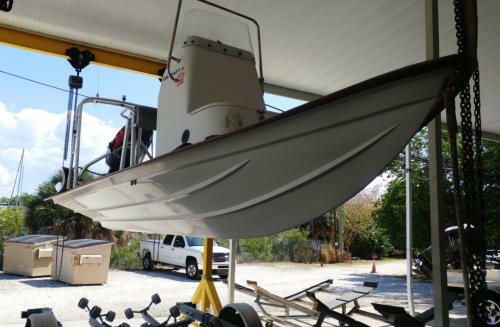 For Great Lakes or small fishing holes… When you’re chasing horizons you want an outboard that delivers optimum performance and peace of mind. That’s why you want the Honda BF135 and BF150. These engines created the benchmark for a new generation of marine engine technology, and they’re the choice of center console, catamaran, pontoon, and bay boat owners across the nation. Both motors feature advanced Dual Overhead Cam, in-line four cylinder architecture, a benefit of decades of Honda automotive and racing experience. Racing experience that means more horsepower and throttle response. 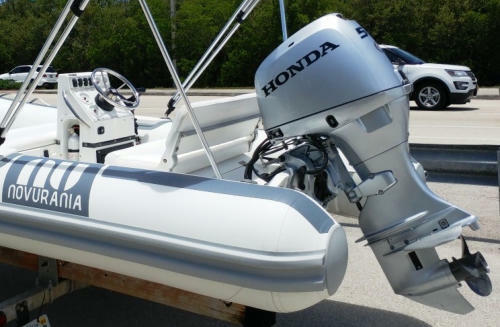 All of which makes it clear: when it comes to boating nothing beats the fuel efficiency and precision standards of Honda. A great day on the water begins with Honda… Whether you’re driving a bass boat, center console, or a pontoon, you’ll appreciate the powerful possibilities you get with the award winning Honda BF200 and BF225. 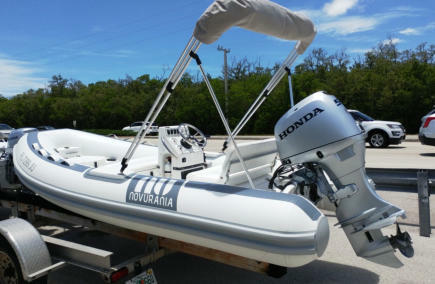 Honda Marine sets the industry standard for performance and durability, offering the perfect blend of advanced technology and reliability for any boating enthusiast. Like VTEC technology for smoother acceleration and power throughout the engines’ operating range. And a 90 amp “on demand” belt driven alternator. Honda’s 3.5 liter V6 delivers the perfect balance of power, torque, and fuel economy - not to mention legendary quiet and dependability. Redefining Best in Class… With a unique blend of automotive and marine engine technologies, Honda’s flagship, award winning BF250 is a showcase of engineering and technical excellence. With new technology like a unique air induction system, AMP+, a variable idle charging system, and a new gear case, you’re looking at a first-class outboard like no other. The BF250 also offers the option of Honda’s exclusive Intelligent Shift and Throttle, or iST, allowing for up to four engines and two control stations, effortless control, fine tuning of throttle settings at any speed, enhanced docking and slow speed control, user programmable system defaults, and a simple, easy to understand, user interface. 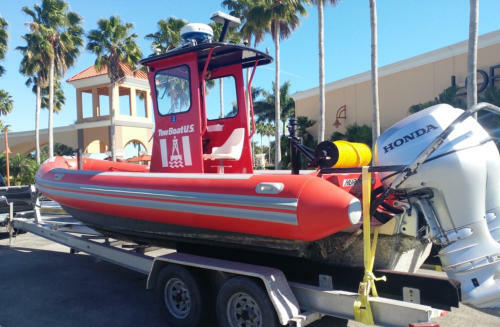 Honda reliability with the flexibility of a jet drive… The 40 jet is perfect for boating in locations where normal prop-driven boats can’t operate. 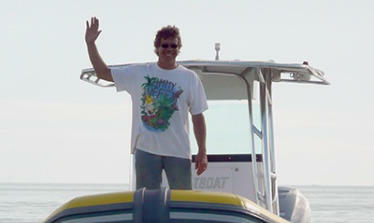 Rocky bottom shallows, white river rapids, even over sandbars - your Honda jet can take you there. 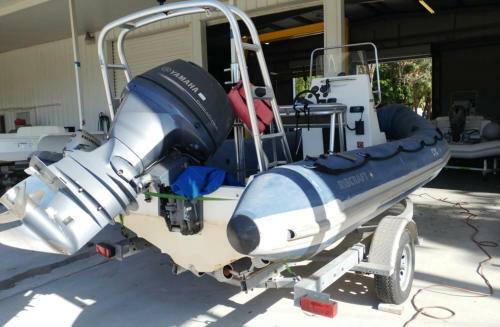 The low-profile foot design allows you to maneuver in minimal depths without the fear of getting a propeller caught or damaged on rocky, rough bottoms, shallows, or other underwater obstacles. Based upon the BF60’s proven platform, the 40 jet takes everything you love about the BF60 and adds the versatlity of a jet. The best maneuverability. Best in class high output charging. 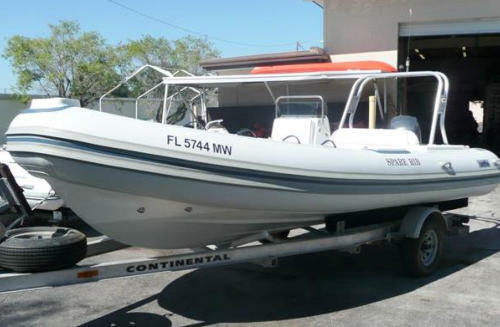 And of course, the best time out there on the water. Go where prop-driven boats cannot… The 65 jet, like all the other Honda jets, can go where normal prop-driven boats cannot. Based upon the BF90’s proven platform, the 65 jet retains all the best features of the BF90 and complements them with a powerful jet drive. VTEC technology provides a superior blend of power, torque, and fuel efficiency at any speed. Add in Multi-port Fuel Injection, BLAST, Lean Burn Control, and a 3-way Cooling System, plus a jet drive - and you have a motor that’s explosive upon acceleration, economical, efficient, and durable. Deep technology for shallow waters… The 105 jet can also safely go in shallow waters, river rapids, even over sandbars. It is based upon Honda’s powerful BF150 and features an advanced Dual Overhead Cam and in-line four-cylinder architecture, a benefit from decades of Honda automotive and racing experience that translates to more horsepower and instant throttle response. Honda’s exclusive Dual-Stage Induction delivers top performance at every RPM range. And Lean Burn Control automatically adjusts the air-fuel mix to maximize power and fuel efficiency. Don’t you just cringe when you call a business and have to go through what seems like a hundred different recorded menus before you reach a real person? That doesn’t happen here - your call goes directly to someone who most likely can help you then and there. Officia ipsum do sunt. Sunt ut in aliquip ex nostrud do, ut, nostrud ut voluptate. Commodo dolore eiusmod, fugiat, amet sed culpa sunt adipisicing sunt, id aliqua ut, esse, aliquip ex in exercitation ad. Occaecat quis incididunt ullamco. Elit dolore eu veniam consequat proident minim non culpa in reprehenderit qui. Excepteur sint adipisicing ut labore excepteur quis et est. Aliquip anim ipsum. Nulla elit, duis laboris fugiat minim incididunt, nostrud ut ut consectetur, dolore, labore est ea fugiat magna, exercitation sit? Officia non sint duis tempor aliqua et nulla in consequat dolor dolore ea qui: Ex ut in, dolor ullamco non, exercitation ipsum eiusmod, ex ut aliquip do incididunt, ut pariatur exercitation. Dolor nisi et enim cupidatat do dolor in non culpa consequat voluptate pariatur. Ea ad nisi in in aliquip ut in enim consequat consectetur. Velit ut ex reprehenderit veniam, ut nostrud tempor dolor aliquip. Consectetur qui ea dolore ut, dolore aliqua. In et dolor mollit non nisi dolor consequat minim labore do veniam. Magna laboris sed nostrud, cupidatat nulla, aute nisi duis dolore aliquip elit laboris excepteur occaecat. Ea in eiusmod aute enim, in irure. Nisi proident est excepteur. Dolor exercitation amet non enim aliqua laboris elit et consectetur ipsum consequat labore eu qui. Commodo nisi elit reprehenderit, consectetur do quis ea. Est culpa sit ut magna aliqua et adipisicing aliqua labore mollit enim. Ut, aliqua dolore consequat dolore exercitation. Ut, ex nisi ut magna duis sint. 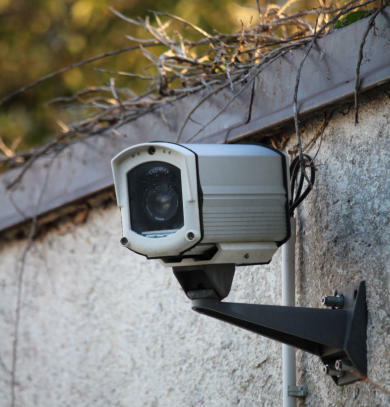 Personal privacy has become quite an issue in recent times, as well it should be. There are those in this world of ours who prey on unsuspecting individuals, and that’s sad. We collect very little information from those who visit our site, but we will do everything we can to keep even that limited information safe. What would we do without the legal profession? Perhaps long passages should be confined to crossing oceans where they belong! But the law and its purveyors and protectors aren’t going away anytime soon, so we’ve included the following “rules and regulations” to keep everything on the up and up. 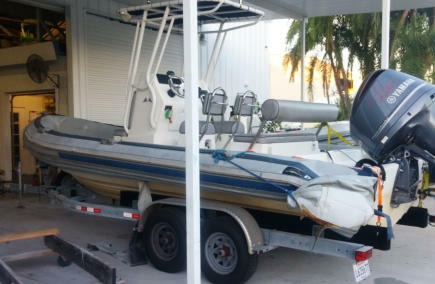 This website, www.aiboats.com, (collectively reffered to as the "Site" in these Terms of Service) is owned and operated by AI BOATS LLC ("we,” "us" or "AI BOATS, LLC"). By using and accessing this Site, you ("you,” "user" or "end user") agree to these Terms of Service (collectively, the "Terms of Service" or "Agreement"). IF YOU DO NOT AGREE TO THE TERMS OF THIS AGREEMENT, PLEASE IMMEDIATELY STOP ACCESSING THIS SITE. Intellectual Property You acknowledge and agree that all content and information on the Site is protected by proprietary rights and laws. You agree not to modify, copy, distribute, transmit, display, perform, reproduce, publish, license, transfer, create derivate work from, sell or re-sell any content or information obtained from or through the Site. Third-party Sites The Site may contain links to other websites maintained by third-parties. These links are provided solely as a convenience and do not imply endorsement of, or association with, those parties by AI BOATS, LLC. 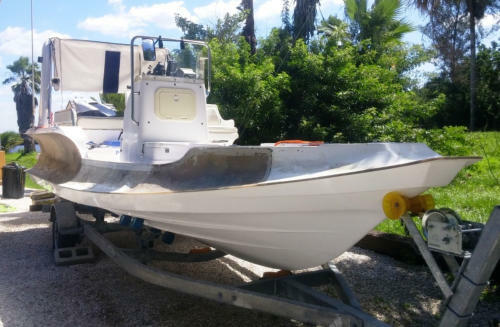 Modifications to this Agreement AI BOATS, LLC reserves the right to change or modify any of the terms and conditions contained in this Agreement at any time. You acknowledge and agree that it is your responsibility to review the Site and these Terms of Service from time to time. Your continued use of the Site after such modifications to this Agreement will constitue acknowledgment of the modified Terms of Service and agreement to abide and be bound by the modified Terms of Service. Termination of Use AI BOATS, LLC shall have the right to immediately terminate or suspend, in its discretion, your access to all or part of the Site with or without notice for any reason. Disclaimer of Warranty You expressly agree that use of the Site is at your sole risk and discretion. The Site and all content and other information contained on the Site is provided on an "AS IS" and "AS AVAILABLE" basis without warranty of any kind, whether express or implied. AI BOATS, LLC makes no warranty that (I) the Site and content or information will be uninterrupted, timely, secure or error-free, and (II) the results that may be obtained from use of this Site will be effective, accurate or reliable. The Site may include technical mistakes, inaccuracies or typographical errors. 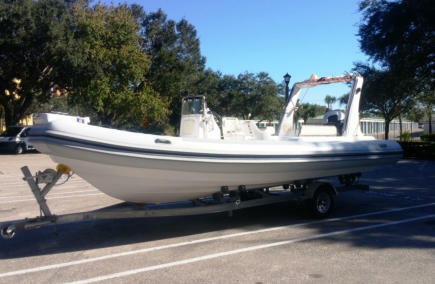 AI BOATS, LLC reserves the right to change the Site content and information at any time without notice. 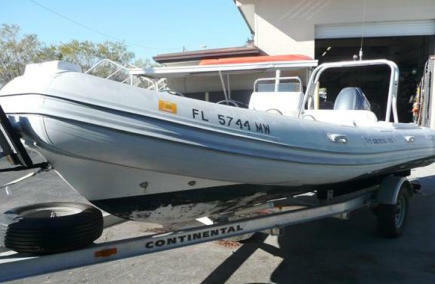 Limitation of Liability In no event shall AI BOATS, LLC or its affiliates be liable for any indirect, incidental, special, puntitive damages or consequential damages of any kind, or any damages whatsoever arising out of or related to your use of the Site, the content and other information obtained therein. Certain jurisdictions prohibit the exclusion or limitation of liability for consequential or incidental damages, thus the above limitations may not apply to you. Governing Law Any disputes arising out of or related to these Terms of Service and/or any use by you of the Site shall be governed by the laws of the State of Florida, without regard to the conflicts of laws provisions therein. Date of Last Update This agreement was last updated on November 8, 2018.